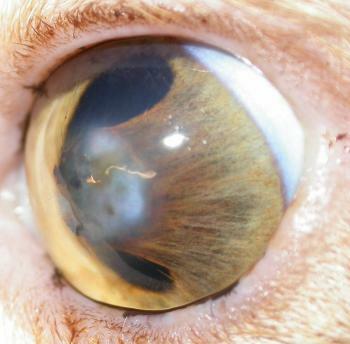 What has caused the corneal opacity in this cat’s eye? Are there other ocular signs which give you a clue? A rather more lateral view shows a wide band of iris adherent to the cornea. This is an anterior synechia and shows that a penetrating injury has occured previously. Iris was swept forward by the exiting aqueous humour during the trauma and has successfully plugged the gap, but the cornea has healed with an area of oedema and scarring. 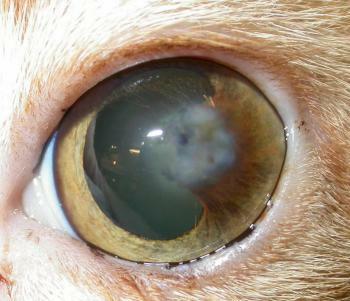 This entry was posted in Cases and tagged cat, corneal opacity. Bookmark the permalink.